The Ace Business Communicator Prize aims at recognising and rewarding young in-house communicators – A collaboration by seven organisations including ICG, MxM India, The Holmes Report, School of Communications & Reputation, On Purpose Consulting, Reputation Today and the Promise Foundation. 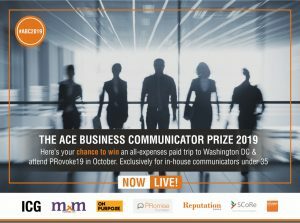 A consortium of organisations led by the Promise Foundation, is pleased to announce the revamped Ace Business Communicator Prize for young in-house professionals, which will see one young communications professional flown to PRovoke19, organised by The Holmes Report in Washington DC in October. The ABC Prize was instituted to encourage young talent in communications. Professionals will individually respond to a brief on social change in a record time which will be evaluated by senior members of the ICG (Indian Communicators Group) as well as Arun Sudhaman of The Holmes Report and a representative of On Purpose Consulting. The brief is available at the end of this note. The winners will be publicly announced at INCC 2019 and will be funded to travel to PRovoke. To be eligible for the prize the individual should be born on or after January 1st 1984 and should have a valid passport. The contest opens on 25th March and the last date to submit the responses, without any fee, is 25th April. We will accept entries until April 30th for a fee of Rs 1000/- per entry. Entries should be submitted with a scanned copy of the passport. The response to the case should be sent as a pdf, running not more than two pages, with file name ABC Prize 2019_First name_ Last name and the same to be mentioned in subject line as well and sent to team at reputationtoday dot in with copy to editor at reputationtoday.in. No where in the attachment should the name of the organisation, where the team works, be mentioned. The jury will decide the winner by May 10th and the individual will be informed by May 16th in order to make visa and flight arrangements. The winner will have the opportunity to join PR and communications leaders from around the world at PRovoke19, courtesy The Holmes Report. The annual summit takes place in Washington DC from 21 – 23 October, 2019. The winner will write one exclusive article sharing his/her experience from the global event by November 15th. This will be published on the Reputation Today portal. PRovoke19 is a high-level forum held annually, that aims to provoke senior practitioners around the critical issues facing the profession and the companies it serves. The summit attracts a diverse group of top-tier speakers and delegates from across the globe, including more than 60 brand side speakers in 2018 alone. The prize worth Rs 1.5 lakh each in kind includes a round-trip economy flight ticket to Washington DC from an Indian metro and visa costs wherever applicable, supported by ICG and Reputation Today and its partners, a two-day delegate pass to PRovoke from The Holmes Report and stay for two nights in Washington DC supported by On Purpose Consulting and the School of Communications & Reputation (SCORE). The winner also gets an opportunity to be mentored by Seema Ahuja and Shravani Dang – both senior communicators who are supporting the prize in their personal capacity. Additionally, they have access to the leadership at On Purpose Consulting. The winners also get complimentary access to one edition of PRAXIS of their choice. This does not include stay and travel. What can be done to get the message out in an impactful manner about reducing single use plastics and non-biodegradable materials during election campaigning? How would it be possible for parties be prompted to propagate positive behaviour during campaigning with regards to their usage and distribution of materials that are harmful to the environment? How can the matter be highlighted as one of national and international importance? How would it be possible to get the message out while remaining supportive of the democratic process? In what ways could key stakeholders be engaged with while remaining politically neutral? What steps could we take to extend the conversation to the practice throughout India of using non-biodegradable materials in order to help India keep its commitment to end the use of single use plastics by 2022? Happy New Year from the Reputation Today family!